I must admit, it took me a minute to jump on the macaron bandwagon. I thought they’d go the way of the cupcake craze. Intro to Icing - not a crumb’s first cake decorating class! Cranberry Sauce Redux or Best Cranberry Cake Ever! What do you do with holiday leftovers? I made cranberry bundt cake with mine! Reputation is everything. Good or bad. You'd go to great lengths to protect your rep, because it's important. I mean, perception of a thing might as well be the truth, right? Except when it's not the truth. Take the fruit cake for example. Fruit cake has a bad rep. It's known to be dry, hard, tasteless, and apparently will last until the second coming. That's what they say... But I know different. The fruit cake I know is sweet, spicy, moist. She also has a bit of an alcohol problem, but who doesn't?! I want to introduce you to her, but please don't judge her before you get to know her. Friend, meet Jamaican fruit cake. Jamaican fruit cake, meet my friend. Where did she come from? Didn't I just say she's Jamaican? Oh, you mean originally. Well her dad was an English fruit cake, and her mom was a plum pudding. When they moved to Jamaica, she got that lovely dark complexion. That's also where she developed a taste for rum. Not just any rum, but Jamaican overproof rum made by Uncle Wray and his Nephew. Jamaican fruit cake is sometimes called black cake or rum cake, but at the heart, it's a celebration cake served most often at Christmastime, weddings and christenings. Jamaican fruit cake is expensive to make due to all of the fruits, spirits and spices, and time involved. It contains mostly dark dried fruits such as raisins, currants, prunes, cherries. Those fruits are cooked down into sticky sweet goodness like preserves, with sugar, molasses, cinnamon, cloves, allspice, nutmeg, almond, vanilla, and mixed essence. Everyone's auntie, grandma, and mommy has their own special blend, but there's a whole heap of liquor in the cake. Most commonly, it will contain a sweet red wine, like a port or other dessert wine, brandy, dark rum, and Wray and Nephew white rum. Are you drunk yet? Because I'm feeling a little tipsy myself. Once all of that has been combined, the fruits are left to marinate in that boozy heaven for up to a year. Most people put up, or "soak" their fruits right after New Year's for the upcoming Christmas. 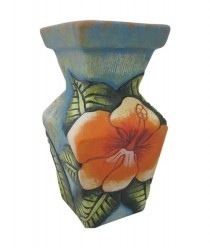 Everyone has a special vessel for their fruits; it could be an earthen jug, plastic bucket or jar. No matter the container, nothing else goes in it except fruits. The process for mixing up a fruit cake is like making a pound cake. You want to cream your butter and sugar together, then add your "browning" or burnt sugar. After that you'll add your flour and fruits, alternating between dry and wet ingredients. While you'll want to use a mixer to cream the butter and sugar, nothing mixes up a good cake like an old fashioned wooden spoon. Bake low and slow for hours. Once set, you'll take her out of the oven, cool just a bit, then liberally douse with more wine and rum (I told you she had a problem), cover with foil and let rest. The longer she rests, the better she tastes, so this is a cake you can make a week before you plan to serve it. Jamaican fruit cake can be eaten just like that with no other adornments, but it is frequently presented covered in brittle royal icing, a sweet counterpoint to the savory spices, and bite of the alcohol. 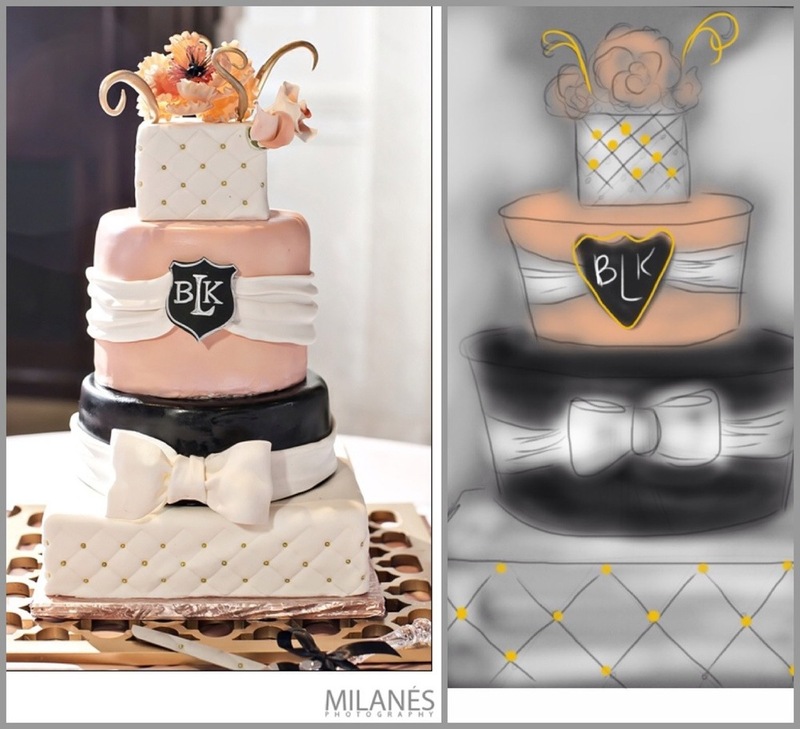 For brides with a more modern design sensibility, cakes can be covered in rolled fondant. If you're up for the challenge, you can attempt this lovely cake on your own. The Internet abounds with lots of recipes (you didn't think I'd give you mine did you?). Should you feel like it's more fun to eat than to bake, be sure to give not a crumb! a call. I'd be happy to bake up some rummy happiness and ship it right to you! not a crumb! will be taking orders for Christmas cake, packed in festive keepsake tins, beginning October 1st. Please visit us at www.notacrumb.com to place your order, or join our mailing list to be kept up to date on our seasonal offerings. Girl cakes are easy...boy cakes are hard! Wait... That didn't come out right! What I mean is, that it's easier to come up with ideas for cakes for girls than it is for guys. When it comes down to it, you can always throw a flower or two on a round cake, and voila! instant feminine, girly cake. Man cakes should be manly; they should roar, or beat their chests, or involve tools and grunting, maybe. Cake is soft, and light. Icing is fluffy, and delicate and pretty. So you see the problem right? How to turn all the soft, yummy goodness into macho, macho, man cake. At the very least, there should be alcohol! So what to do when choosing a cake for the special man in your life? Look at their hobbies, favorite beverage, favorite team or sport! and let the cakeist do her thing. Here are a few of my favorite cakes for men over the years. this past week i chatted with a couple of friends in the wedding/event industry. we were talking about the fact that our busy season is winding down, and trying to figure out what to do during the slower holiday season. one of my friends was feeling a little bit down in the dumps about having to take on freelance work with another business to keep money flowing in. it's a hard thing to work for someone else when you've committed yourself to being an entrepreneur. i mean, at some point you told "the man" to "take this job and shove it", and now you're having to say, "my bad, i need to come back for a couple of days, weeks... maybe a month or two, pretty please with sugar on top". isn't that a step backwards? i don't think so. lots of businesses fail, not because the idea is faulty, or the skills are lacking, or because they don't work hard, but because people run out of capital. let's face it, you need cold, hard cash to buy supplies, ingredients, and to market yourself. you also need cold, hard cash to keep your house in order - rent/mortgage needs to be paid, lights need to stay on, and food needs to stay in the fridge. so it's all about short-term sacrifice for long-term gain. you become a small business owner, to fulfill a dream; not to stop working, but to control the way you work - who you work for, when you work, how you work. whether it's your customers or someone else's, you work for the customer and for reasons of your own choosing. what makes your dream a reality is your hard work. So much has happened since my last (published) post (let's not talk about the drafts waiting in the cue), I can’t possibly fit it all in here – I suppose that’s the problem with life; it moves at a frenetic pace. By the time you’re ready to talk about something, something else has transpired. I had all sorts of posts planned in my mind, and then Steve Jobs passed away. That’s when I decided I wanted to talk about him and the impact he’s had on my life. What do Steve Jobs and cake have to do with each other? On the surface, not a whole lot. What does Jobs have to do with me? The first computer I ever touched was an Apple IIe. The first one I owned – a Performa. Three imacs, an ibook, macbook, shuffle, nano, and an ipod touch later, there is not a day that I don’t interact with something that Jobs influenced or made. His inventions help me be more efficient (on the days I’m not procrastinating). They enable me to make my own website and marketing materials; to blog and facebook and twitter my days away. They keep me sane on airplanes when my seat mate wants to talk me to death, and on the rare occasion I get on a treadmill, my ipod keeps me walking towards nowhere. I am a mac (among other things)! This is important because Job’s legacy is thinking outside of the box; creating something not only new, but intuitive. Sophisticated but basic. Modern but simple. Complex but easy to use, and at the end of the day, standing alone, all those beautiful pieces of technology are art. Here’s the cake connection. I get asked often, “what’s the hardest cake you’ve ever had to do?” Truthfully, every one is a challenge because every cake is new, something I haven’t done before. But after really thinking about it, the most difficult cakes are the ones where I’m asked to duplicate something that’s already been done. Think about all of the remakes of popular songs. No one wants to hear someone sing a classic song and butcher it, or not bring something new to the table. You want it to be better than the original – even awesome – er! Think about how many bad renditions of favorites we’ve heard on American Idol (shudder)! Don’t get it twisted… I LOVE to make cake. Pretty much any kind of cake, except cupcakes (that’s for another post). But I really don’t want to copy someone else’s cake. I don’t even want to copy my own cakes! I want to take cake, and transform it… create a new cake experience that will truly reflect the occasion and the people being celebrated. Forget Mike; I want to be like Jobs. Truly, with every cake, I want to go further, push the envelope, and innovate. I want for people to want to duplicate me. Isn’t that what Jobs did? How many other mp3 players are out there, that we can name? I think there’s that Zune thing (not sure if it’s still around). Ipod has become synonymous with mp3 players. Yup. When people think cake, I want them to think not a crumb!. So what do youwant to do with your life, career, passion? Duplicate, create or innovate? I've gotten a lot of requests lately for really fantastic cakes _ wedding cakes and groom's cakes and it got me thinking about old movies, but one in particular. Kramer vs. Kramer, where a husband and wife face off in court as opposing sides on the same case. It made me think about competition because in weddings where I've done both, the groom's cake has been more intricate than the wedding cake. To me it takes away from the wedding cake being a centerpiece. What do you think? 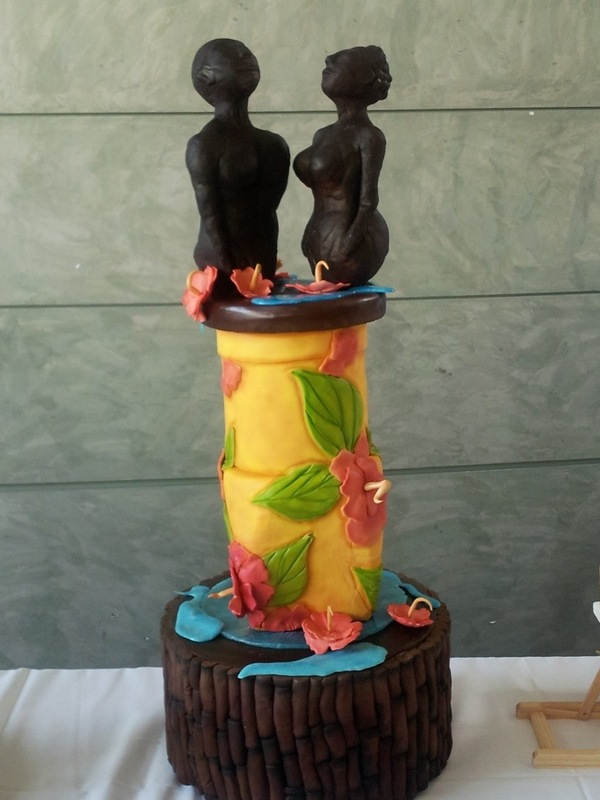 Should the wedding cake take the spotlight, or should it share prominence with the groom's cake? if you watch any of the reality cake shows ( i watch all of them - even the ones i can't stand... more about that in another post), you'll see the bride & groom sitting with the esteemed cake decorator, and then they say something like..."i'm having a luau, spa, winter, outdoor, polka dot wedding, and i want you to make a fantastic cake! oh and we really love our dog, roscoe!". and then buddy, or duff, or someone on cake challenge makes a 4ft tall dog wearing a lei and a parka, skiing down a mountain with polka dot boots, and the bride & groom fall in love the minute they see it (it's perfect! it's better than we could have imagined! it looks just like roscoe if he were skiing in hawaii!) at their wedding reception with cameras rolling, and then said cake decorator gets showered with gratitude. yeah...that's not how it works. brides and grooms come in with a general idea of what they want - something round, or square, traditional or whimsical, (well the grooms come in to taste cake - they're not that interested in the pretty cakes). then i show them enough pictures to confuse them and make them change their mind. this is key to the process, because what i really want to know is how you decorate your house, and what colors you love. whether you'd wear stripes or polka dots or plaid. what country you'd love to travel to. this is where the design comes from, and it can't be accomplished in a 30 second segment. it takes a little time; we have to date a bit so that i can get to know you, and you can get to trust me! i had a wedding cake this weekend that i absolutely love. i think it is my favorite (for now). it's because it was very different than what i normally do in terms of wedding cake. it was fun because the bride and groom let me do what i wanted! which was what they wanted even though they didn't know it initially. they came in wanting a simple, elegant 3 tier white cake. boring... they however, were not boring people, so why get a boring cake? they were interesting, and quirky, and from the middle east. the reception was at a lebanese restaurant. plain, white cake? yeah right. so we looked through some books, and they fell in love with an offset cake (inside i did a little jig, and then a booty shake), but not the design on that cake. bride: "could you do something that has a byzantine feel/pattern?" this is the byzantine door interpreted in cake, and their black, white and ivory color scheme. last week i attended entrepreneur magazine's growth conference in atlanta ( #growthconference ) and one word kept popping up in my head, no matter the session i was in - CHANGE. all of the presenters talked about how change is inevitable and necessary for growth. although i am a change-o-phobe (i think change is all good when it happens to other people), i could hear the wisdom in what they were saying. the end of the year always brings about a certain amount of reflection - what have i accomplished? why didn't i get more done? why is there so much left to do?!!!! it's difficult to see how much has changed and how much progress you have made; the forest for the trees if you will, or the trees for the forest (to-may-toe, to-mah-toe). as i sat in the build your brand session, i thought about how much not a crumb! has grown. to me progress is about evolution, adapting and growing stronger, smarter, better, more FABULOUS! when i graduated from college, a girlfriend gave each of us in our circle, a crystal paperweight. in bold type it said "the evolution of man". pictured below, there were sets of footprints, leading from primate, to barefoot, to a print of a pair of man's shoes, to a woman's stiletto. i thought it was hilarious - that the most evolved version of man is a woman. i don't believe that to be true (that's for all the men reading this)! the image always stuck with me; this idea of moving forward. i want to share a little of not a crumb! 's evolution. i started baking as a kid because my mom baked and i was an only child, so i didn't really have any where to be but in the kitchen up under her arm... my mom and my godmother had a little business making wedding cakes and special occasion cakes. they had a whole system, my mom would do the baking during the day after work, and my godmother would decorate in the evening when she got off of work. they did that for most of my school years until my godmother moved to the land of the retired, at which point my mom continued on by herself, with me very occasionally assisting. i went onto college never thinking that baking as a career was in my future, returned home and baked strictly for fun, until people started asking if they could pay me to make cakes. i then convinced my mom to come out of semi- cake retirement. that's when not a crumb! was born. so for the next 5 years we baked together (not always peacefully - hey we are mother and daughter! ), and then i moved to atlanta from ny, and we became a two state operation. it took two years of lobbying, but i convinced my parents to move down to the a this past july, and once again, i've got my mom working with, and supporting me! fast forward 7 years from my move to the peach state, and not a crumb! has surpassed my initial dreams. we've moved from a hobby to a business! one of my cakes was spotlighted in a national magazine (get married! ), and my cake was featured at the unveiled wedding show in november, and i've been making cakes far beyond what i ever thought i could make! change is a good great thing when we allow it to propel us forward, progress and evolve! the end of the year pensiveness was much needed for me. it reminded me that although i didn't meet all my goals for 2010, i've done a whole lot, and didn't allow negative changes to steamroll me. change is always an opportunity for growth. not a crumb! has even more changes coming, and i can't wait to tell you about them (actually i can wait, but it's really, really hard, because it's such exciting news!). check back to see what's up! grandma just loves her crosswords! i hope to be in as good mental and physical shape as betty and my dear old dad... now if i could just put down the brownies... sigh.